Photographer Nat Finkelstein (1933-2009) entered Andy Warhol’s Factory as a photojournalist in 1964. He, along with Warhol and others, contributed to 1968’s The Andy Warhol Index. In 1992, Finkelstein released – in a limited, numbered edition of 200 copies – A Catalogue as Multiple: Andy Warhol. 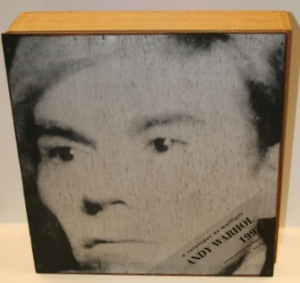 Newly acquired by the William R. Jenkins Architecture and Art Library, “the catalogue…consists of a handmade wooden box… the top and bottom of which have a silk screened portrait of Warhol made and signed by Nat Finkelstein. The box contains a mirror with a silk screened portrait of Nico, an Andy Warhol bottle, a rubber ball, and a catalogue – in loose sheets – describing more than a hundred various Andy Warhol items.”–Prospectus. Both The Andy Warhol Index and A Catalogue as Multiple: Andy Warhol (its contents displayed) are currently on view upstairs at the Architecture and Art Library. Pop in for a peek at some Pop art artifacts. A Zine Workshop, led by Zine Fest Houston, hosted by the Blaffer Art Museum, and organized by the Jenkins Library Ambassadors, the Architecture and Art Library’s student leadership organization, was held in April. The work created at the workshop can now be viewed on flickr. A printed copy will be available in the Architecture and Art Library collection later this summer. If you are interested in joining the Jenkins Library Ambassadors or learning more about their programming, email archlib@uh.edu or visit the organization’s UH website(requires CougarNet login). This is the fifth summer that the UH Libraries and the Women’s Resource Center have co-sponsored a book discussion group for UH students, employees, and friends. Bring a brown bag lunch and we’ll provide the drinks and desserts. All students, staff, faculty and alumni are welcome to participate. Contact Catherine Essinger at cwessinger@uh.edu if you wish to borrow a copy of the book through the UH Libraries.